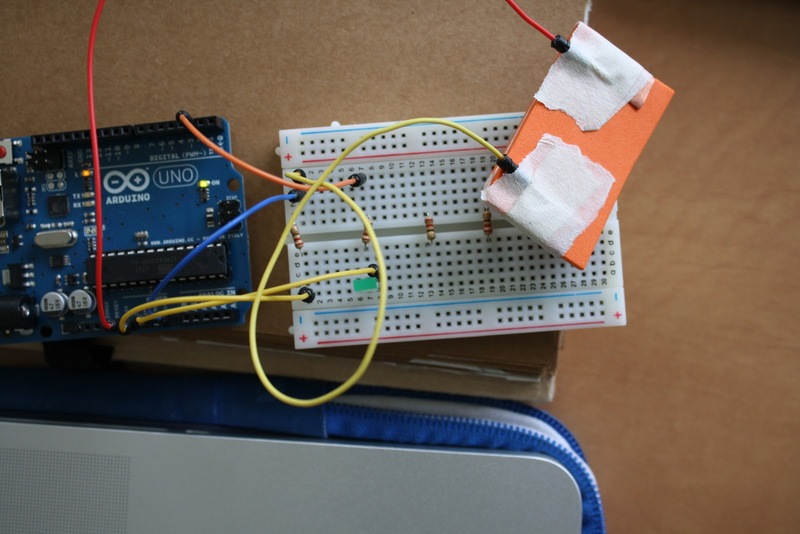 Another session with the Arduino Uno has revealed some more interesting and simple creative methods of making electronic components. This week we made a very simple squeeze switch using Crepla (orange), Copper Fabric, and resistive plastic (embedded with carbon). The crepla creates the base upon which you (double sided) tape the copper fabric to in a strip with 1cm off one end. This is duplicated. Then sandwiching the resistive plastic in between, top and tailing the crepla pieces, the whole thing sticks together to make a switch. 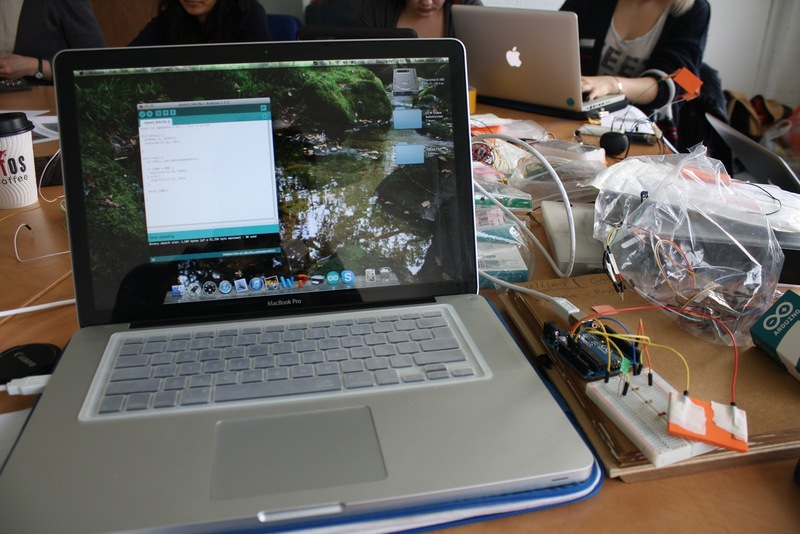 We then had the opportunity to connect various sensing components, such as a range sensor, which could potentially be used to trigger another element on the Arduino such as light. I have already experimented with this partially using the light sensitivity metre in my previous post(s). I am beginning to think that it might be worth investing in some of this equipment to ‘play’ around with for potential future projects. After watching Kate further construct her signally glove – (a glove with LEDs in the fingers designed to illuminate when your hand is removed from the handle bars of your bike for signally left and right, incorporating a similar design of squeeze switch powered by the Lily Pad). 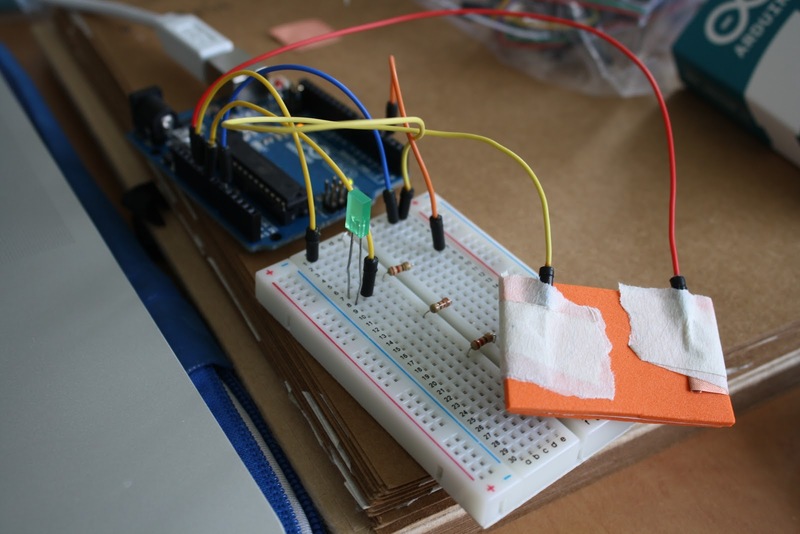 I have become very intrigued to investigate the prospective applications of using Arduinos’ in textile applications.